I’m not sure this can be improved on. Any more. 3 cups cold, cooked rice. We cook it in a rice cooker, leftover is perfect! A smoking hot pan and preferably it is a wok, but not necessarily required. A wok does make it easier to keep everything *in* the pan… making cleaning the stove top easier. Saute the meat, remove from pan. Or use leftovers…. Chicken, pork, whatever you’ve got, or no meat, it’s up to you. Saute the mushrooms, leave alone, let brown, but don’t allow them to shrink to nothing, or someone may not have enough for leftovers….. Remove from pan. Saute the onions, along with the white part of the green onions, after several minutes add 1/2 or so of the green part of the green onions, half the bean sprouts, the garlic and ginger. After cooking for several more minutes, the onions have wilted and taken on some color, push to the side and scramble up the eggs, right there in the open spot. When they are close to being done, but still wet, stir them into the onions. Add back in the mushrooms, pork, more green onions, more bean sprouts and break the rice up into it, and give a nice toss. Stir in the liquids, stir up, again. Look around and make sure you’ve used up all your ingredients, except for a few green onions and bean sprouts, for topping. This is where the name *fried* rice comes into play. After several minutes the rice, on the underside, will take on a beautiful color and the smell will knock you off your feet. Stir well, one last time. Top servings with the last of the green onions and bean sprouts. Don’t be afraid to make it your own and let me know if you try it! P.S. The big guy wants me to tell you that sometimes my links, for products on Amazon, are linked to me so that if you buy something I get a little Amazon store credit. I didn’t used to do this, but I started to recently because I was linking to Amazon anyways (hello, we all shop there) and I figured you wouldn’t mind if Amazon has to give me a free book now and then. Just letting you know, to keep things legit around here. 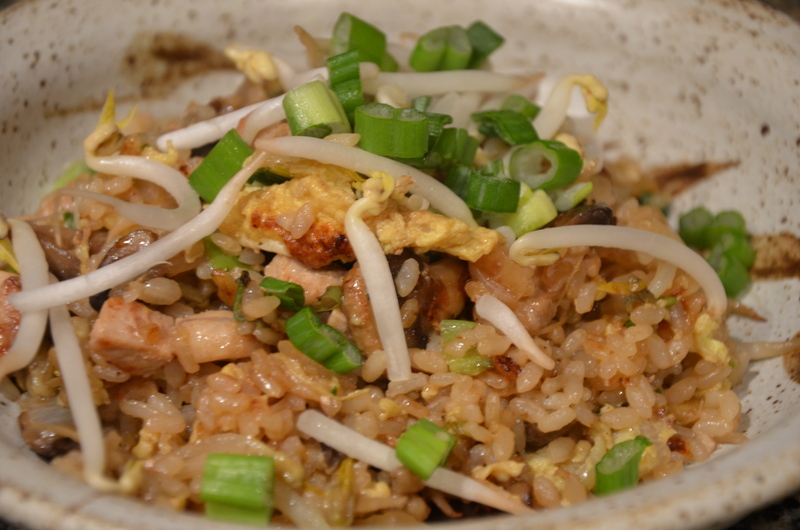 This entry was posted in Cooking, Photography, Recipes and tagged cooking, most popular post, pork fried rice, recipes, rice. Bookmark the permalink. YUM! Can I come over for lunch? Braggs is awesome to use. great recipe! Approximately how many does this serve? Approximately how many does this recipe serve? This makes a good bit. It serves at least 4 with welcome leftovers!